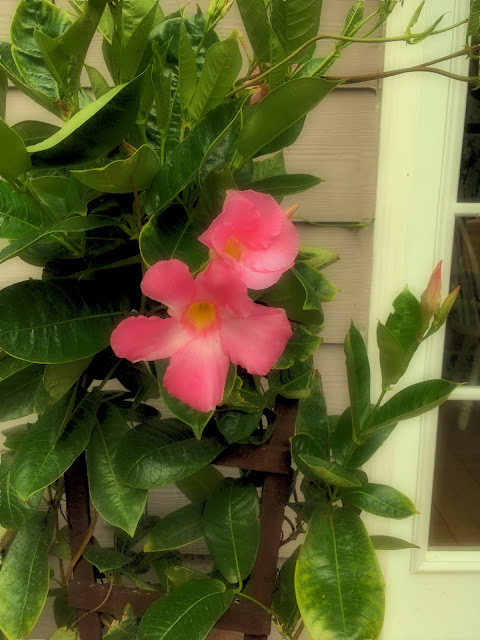 The Mandevilla we had for years died this spring. We kept in inside over the winter and took it out when the weather changed. It sprouted a few shoots but then turned tobacco brown. I dumped the remains into our compost pile and wrote it off as an unsolved mystery. Then last week when we visited our local produce stand, they had "monsta" ferns and out in front under their shaded entryway, were pink and red Mandevillas. The old one was crimson, but Jilda picked out the pink one to bring home. It only had a few blooms when we repotted it. The space beside the garden door on the deck seemed perfect. Soon after it acclimated to the new space, it put out new buds and they are coming out in force now. After walking this evening, I sat on the deck to cool off before stepping inside. When I started indoors, I stopped and snapped a picture of one of the lower blooms. It is beautiful. I would smile every time I saw it. I'd love that plant too. My indoor Hoya vine is in bloom and around 10:00pm it release it's exotic perfume. Heavenly. You keep saying Spring in the nicest way! That is pretty flower! It is beautiful.So glad you could find a replacement for the one you lost. Very nice replacement, you did good. So pretty. It will give you both years of enjoyment. It would seem that plant is happy with you.